This roundabout sign is part of our road legal sign range. The sign can be post mounted using common channel fixings that are supplied separately. This sign requires two clips per sign face. When installed on a roundabout this sign indicates the direction of travel that should be undertaken. The high-grade R2 (previously RA2) grade material used makes this sign easy to spot regardless of the weather conditions. Although this sign is road grade, it can, of course, be placed on private car parks or private roads. The sign face is made from a composite material consisting of two aluminium skins sandwiching a plastic core. This makes the sign very durable, cost-effective, and also means it has no scrap value, so is not attractive to metal thieves. Each sign face has two channels on the rear that can be used with our sign clips to mount this to posts. 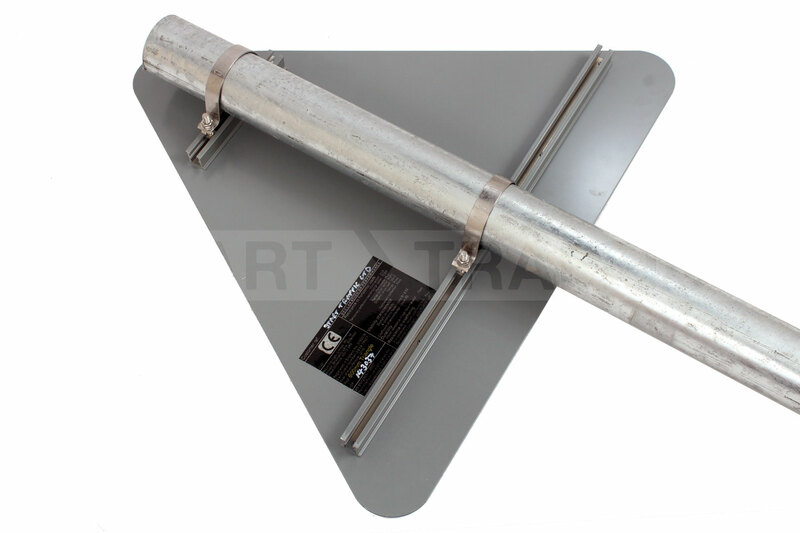 Both the post and clamps are available separately and are not included. You will frequently see this sign in use with diagram 515 chevron signs. Please see page 23 of the TSRGD Guidelines Chapter 3 for exact fitting information. Need A Different Sign Or A Different Size? No problem, we are here to help on 01905 794 875. Our customer service team will assist you in finding just the right sign for your needs.